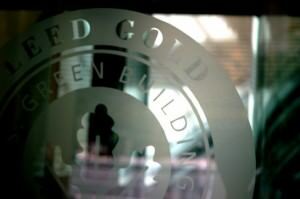 We just received LEED Gold certification! Well, the complex where our office is located, a 17-floor building with nearly 700,000 square feet operated by Brookfield Office Properties. LEED certification, which stands for Leadership in Energy & Environmental Design, is a designation from the U.S. Green Building Council awarded to energy-efficient projects in the categories of Building Design and Construction, Interior Design and Construction, Operations and Maintenance, Neighborhood Development, and Homes. The goal of the certification program is to recognize sustainable and innovative facilities and strategies. LEED certified buildings help conserve energy, using about 30 percent less than the national average, and reduce water consumption. In addition, these buildings help to save money, improve indoor air quality, and better promote the use of more sustainable and more effective building materials. With more than 44,000 LEED projects in North America, and others throughout the world, the reach and impact of LEED is substantial. LEED Gold, second to only Platinum certification, requires 60–79 points; base-level certification requires 40–49 points and Silver certification requires 50–59 points. LEED credentials are also available for professionals who work in the green buildings field. While these are relatively painless steps that we have taken, we are also exploring larger efforts that we can do as a building to reduce our carbon footprint and be more energy efficient. Perhaps the LEED Platinum designation is in our building’s future. In the meantime, every little bit helps.